Everyone will enjoy this moist and easy yellow cake recipe made from scratch. Offering many more homemade cake recipes for you to call your own. Enjoy. PREHEAT oven to 350 degrees. Butter two 9 inch cake pans and dust the inside with flour and tap out excess. Line the bottom of the pans with wax or parchment paper. Put the cake pans on a baking sheet also lined with parchment paper or a silicone mat. Measure and sift the dry ingredients together. In a mixing bowl, cream the shortening and butter together. 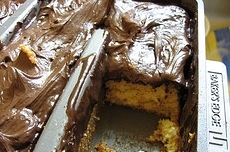 For the lightest cake texture, be sure to cream the shortening and sugar very well, 2-3 minutes if using a stand mixer. Add the vanilla and eggs, one at a time, beating well after each addition. Add the flour mixture (1/2 cup at a time) alternatively with the milk; beginning and ending with the flour mixture. Pour batter evenly into the prepared cake pans. You will find the wonderful brownie and cake pan here. You've made the perfect cake, now here's the perfect frosting. In a large mixing bowl, cream the butter until light and fluffy. Slowly add the powdered sugar, cocoa and vanilla and beat well. Begin with 1/4 cup of evaporated milk for the desired spreading consistency; adding more if needed.